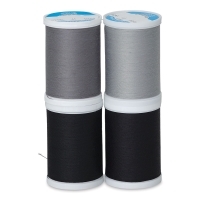 Dual Duty XP Thread is a medium-weight, 100% polyester thread, sized for most hand and machine sewing. Strong and smooth for consistent tension and excellent stitch formation, it can be used on all fibers, knits, and wovens. A new trap spool design holds the thread neatly and securely. The 35 weight thread can be used with machine needles sizes 11 and 14, and hand needles sizes 7 and 8. Dual Duty XP Thread Collection — The collection contains 50, 125 yard spools in a variety of colors, including multi-colored. Dual Duty XP Blacks and Greys Multipack — This set contains four, 250 yard spools in shades of black and grey. 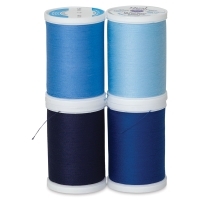 Dual Duty XP Blues Multipack — This set contains four, 250 yard spools in shades of blue. 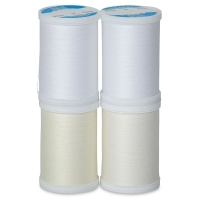 Dual Duty XP Whites Multipack — This set contains four, 250 yard spools in shades of white. 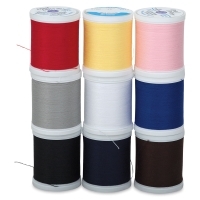 Dual Duty XP Multipack — This set contains nine, 125 yard spools in a variety of colors. ® Coats is a registered trademark.